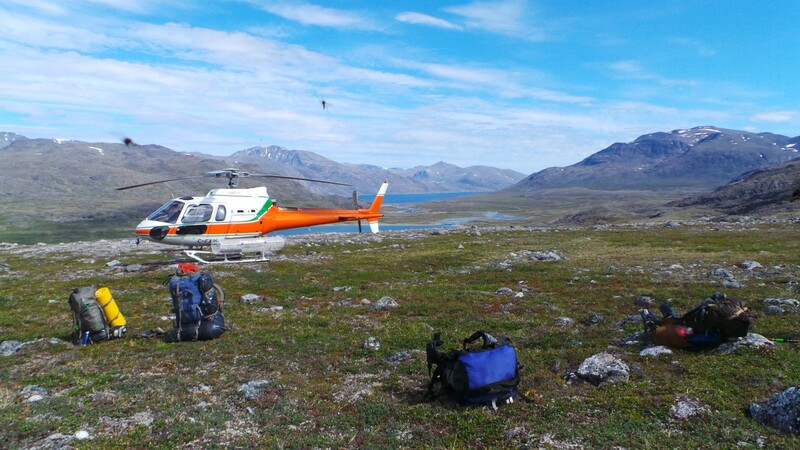 It feels like yesterday that the helicopter pulled up leaving us behind in the most isolated and remote area I had ever been to. Tower Mountain hovered to the south and the only sound were the mosquitos. Ranger Seals, a peculiar type of freshwater seal, popped in and out of Kangaleksurilek Lakes to the north. A polar bear meandered in the distance, too far away to cause any concern. Making us nervous was the reality that Peter and I just finished a 3000 km month long bike tour of BC just a few days earlier. 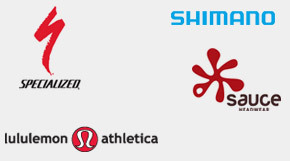 We had no hiking legs. 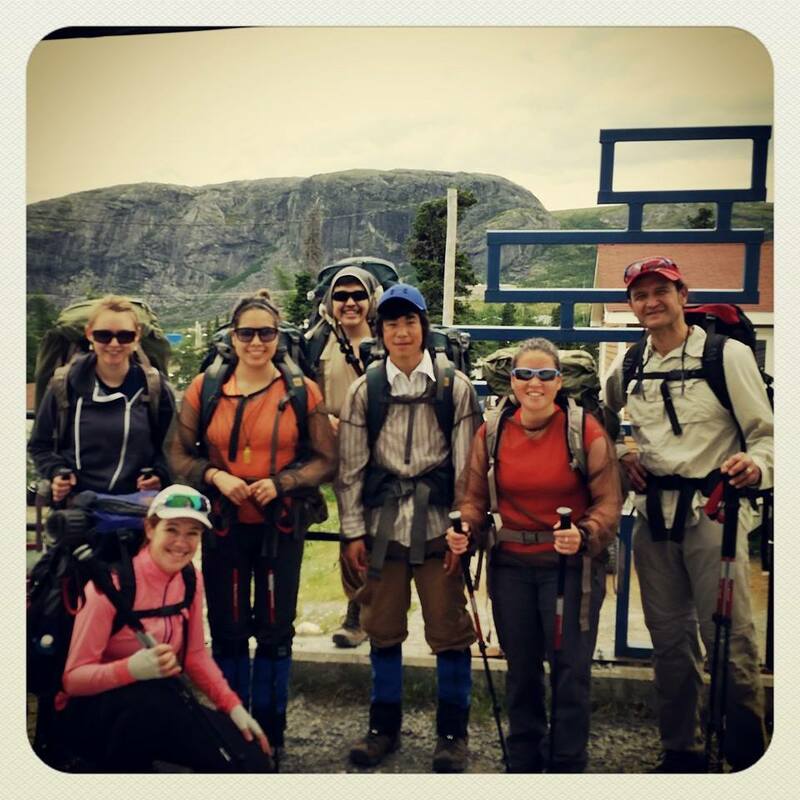 Our companions looked strong and fit and we only hoped their packs would slow them down. I was in the Torngat Mountains National Park with my husband, Peter. 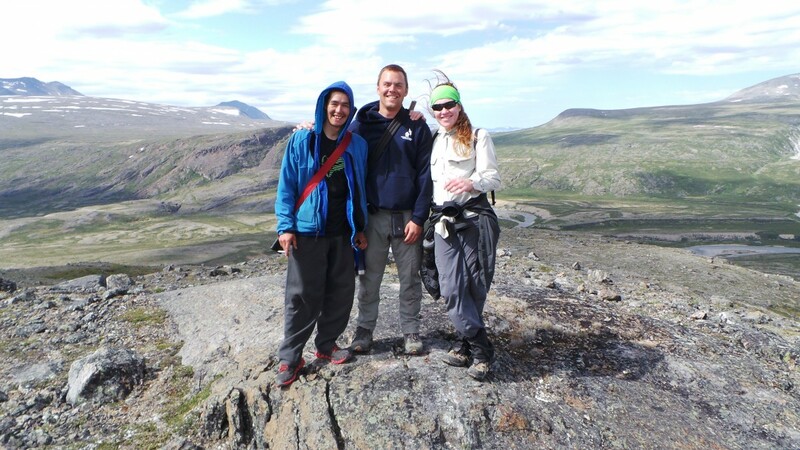 Joining us were two Inuit Parks Canada staff: Andrew Andersen and Neekallak Annanack. Andrew, a man in his mid twenties, was built like an NFL linebacker. He carried a heavily laden backpack weighted down by shotgun shells, bear flares and bangers, along with the usual hiking gear. 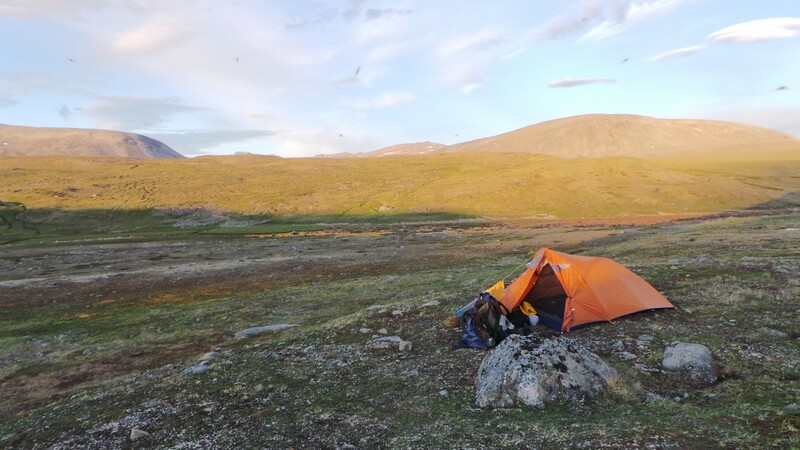 On top of this he had a satellite phone, radio and spare batteries to help with charting the route and keeping in touch with the Parks Basecamp in Sagleck Fiord. He made carrying it look all too easy. Maybe it was his big smile. Andrew was armed but Neekallak, another mid twenty year old, who goes by the shorter name of Ned was there as our ‘bear monitor’. I’d more aptly describe these two as polar bear protection in human form. With short black hair and dark brown eyes, Ned was a slim wiry man whose strength seemed unlimited. His heavy pack, like Andrew’s, made me and Peter look like the most ultra-light weight of hikers, even though all of our special light weight gear stayed home for this trip. Our plan was to hike from the drop off point six days to a southern point of pick up on Nakvak Fjord. It took us a few days longer than anticipated to get out of Basecamp because of fog. It ended up taking us longer to get back because of fog and wind. Such is the unpredictable nature of the weather in the Arctic. I can still see the clear, calm sky and feel the pleasant warm breeze. My memory not only sees but feels Tower Mountain, a pillar of cold grey rock, standing above as if beckoned to be climbed. I can still taste the smoked Char Andrew brought out which they passed around in thick slices. Those moments we sat and ate in silence, marveling at the spectacular scenery surrounding us, stay with me. It’s what I crave when I think of this magnificent place on earth. The feeling of being so alone and so far away from every thing we’ve built this world to be. To be self contained and move through this land is a gift to share with others. We hiked south, up a slope along the base of Tower Mountain. A falcon’s call broke the silence. We were walking through a thick carpet of arctic flora: crowberry, blueberry, dwarf labrador tea, cranberry, lichens, dwarf birch and bearberry (knickknick), to name a few. The hiking turned out to be excellent. One could say it was ‘easy’ in terms of cross country travel. It was this way the entire trip. The opportunity of a lifetime to walk in the Spirit Mountains with two young, old souls. I’ll never forget that first day when we thought we could not be more alone when a single young caribou joined us, approaching closely. Ned said it would most likely follow us for the day as sometimes a single one like this will be lonely for company. He proved to be right. Towards that first early evening we set camp on a rocky ledge above a nearby a stream. It was completely silent. All around us were mountain peaks and ranges marked with patches of snow. And there were mosquitoes. Lots of them. We pitched our tents, filled our water bags, and hiked up to an exposed knoll above camp in hopes of catching a breeze to keep the flies at bay. Just where we perched for dinner an owl seemed to have eaten more than a few meals on the boulders we rested against. As we sipped hot chocolate and enjoyed the scenery. Our caribou came close. Ned stood and raises his arms above his head and let out a muffled airy call to the caribou. To our surprise the caribou approached closer and closer in curiosity. Ned was the caribou whisperer and he entertained us with his antics in getting the caribou to circle around us. We built our first food cache of many that evening from huge boulders. We hoped it would give us time to scare off a bear off before it made off with a bag of food. Losing our food meant more than just inconvenience. We were essentially in the middle of nowhere. All the right precautions had to be made. 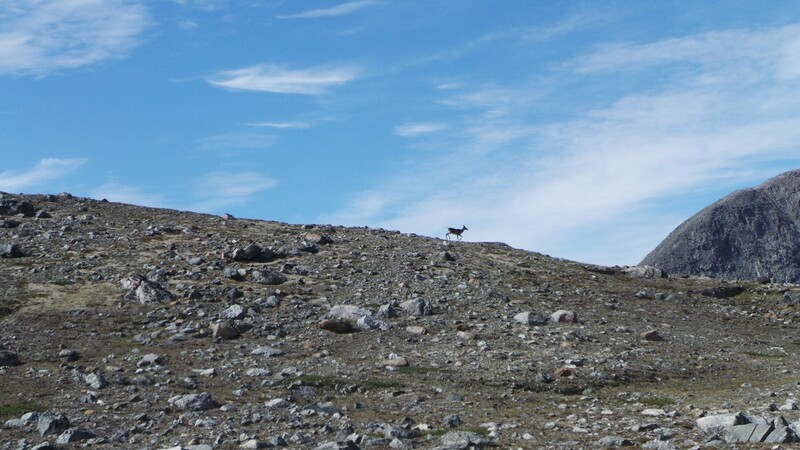 This was just the first afternoon in the Torngat wild. 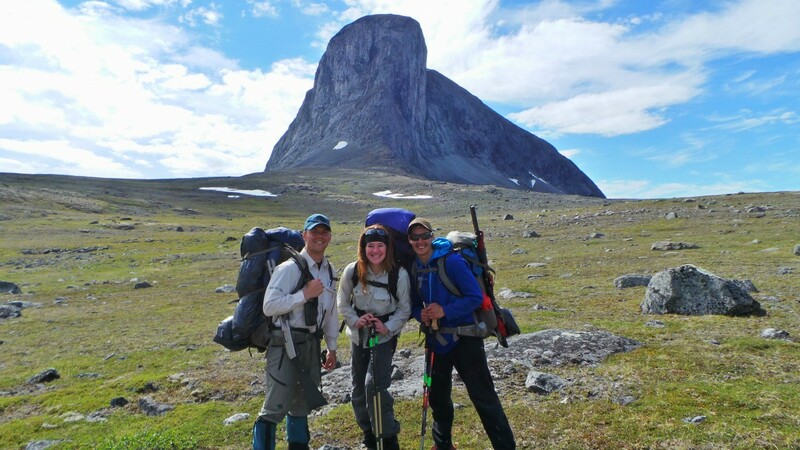 We spent the rest of the trip, some 5 days, hiking, crossing rivers, scaring off black bears, moving through the spectacular wilderness that has been home to the Inuit and their ancestors for thousands of years. Each day allowed us to explore the unique geology, wildlife and vegetation of the region. We literally followed in the footsteps of Inuit who have traveled through the land for centuries. Tent rings, food caches, burial sights and Inuksuit clearly showed us over and over we were not the first, nor would we be the last, to travel there. We came away with not just hiking partners, but friends, in Andrew and Ned. 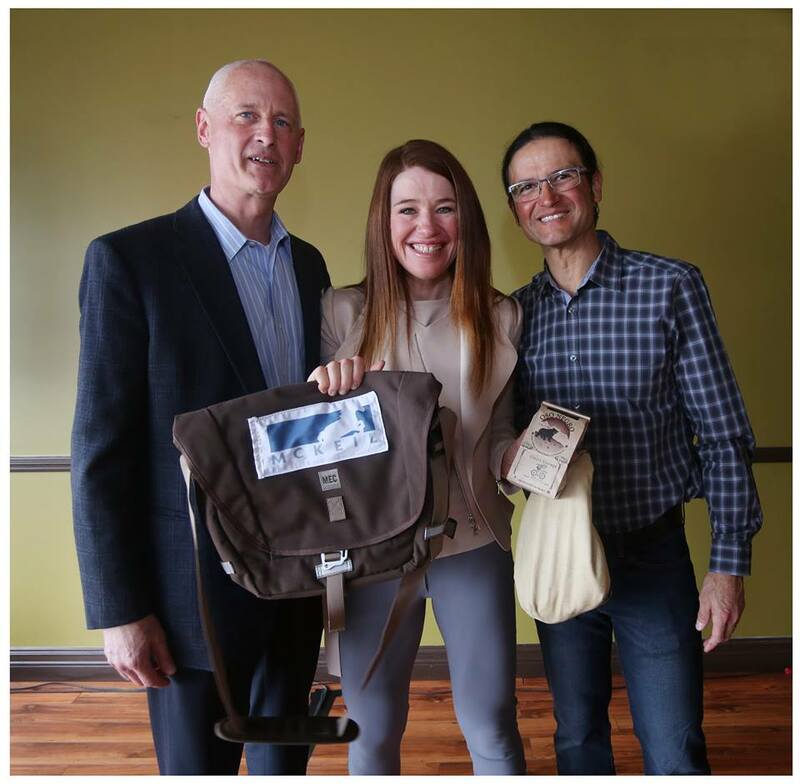 We left with a strong desire to share the gift of experience we’d been given with others. Spending time before and after the backcountry trip at Basecamp was an experience in itself. Taking part in Inuit Games, I showed everyone how not to do the high jump when I fell on my rear end instead of kicking the high-hanging piece of sealskin. We listened to traditional drumming, throat singing, stories from Elders who were essentially living, breathing legends. We went for nature walks, tagging along with research scientists on their excursions, learning how to bead and carve. We fished arctic char, ate home baked goods from baker extraordinaire, Charlotte. We spent time with youth taking part in the kANGIDLUASUk Student Program and left with a clear idea of giving back to these amazing kids. We wanted to give some of the alumni a chance to experience what we had out on the land. 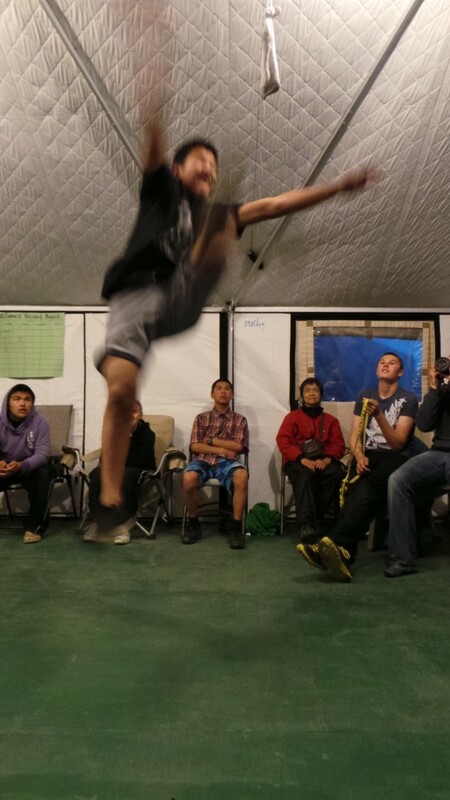 inuit games high kick…so hard! 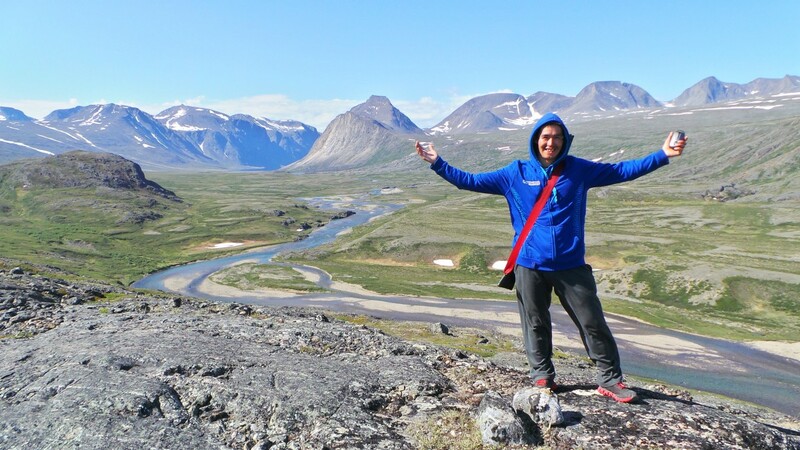 After talking with Mandy Arnold, the program director for kANGIDLUASUk, this idea evolved into the Alumni Pilot Program for a handful of youth from Nunvik and Nunatsiavut. I managed to get funding from a keen supporter of youth involved programs in this region of the North, McKeil Marine. As luck would have it, CEO Steve Fletcher and I were both in St.John’s Newfoundland, soon after this awesome Torngat experience. 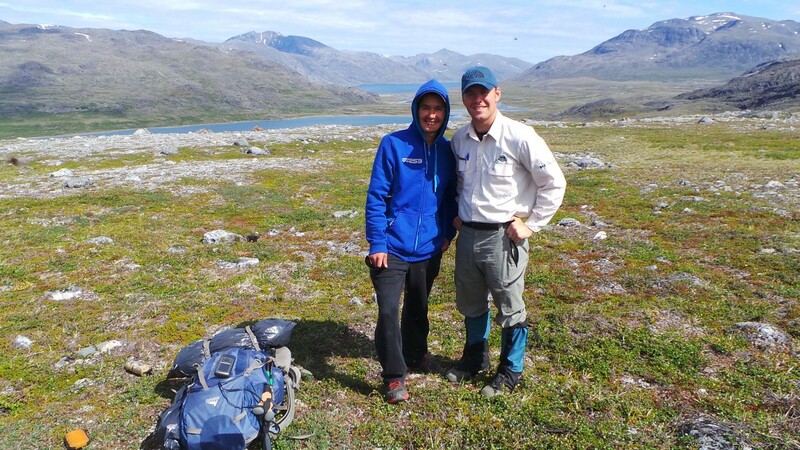 After sharing the meaning and impact on the youth involved, and my dream of bringing a few of the graduates of kANGIDLUASUk out in the Torngat backcountry to have an experience like Peter and I had, Steve said ‘just let us know when and how much’. 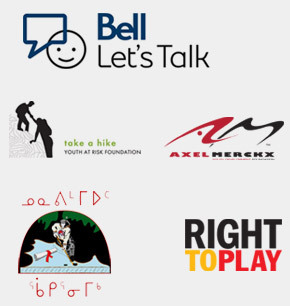 The following year, at the beginning of the Big Ride we did for Bell Let’s Talk, MEC (Mountain Equipment Co-op) messaged me, asking if I could come and present at a conference they were holding for the Quebec and Atlantic Canada stores. I responded that I was kind of busy with the 110 day/11,100km/235 event long ride for mental health awareness, but perhaps they would be interested in supporting the Alumni project that was to take place in July. They were keen and came up with some last minute support, allowing four youth and the program staff to be kitted out for the trip. 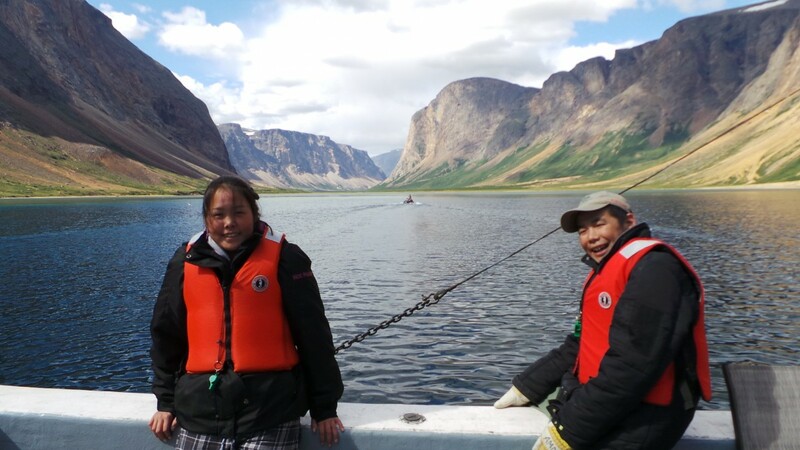 Mandy’s desire to expand the scope of the kANGIDLUASUk Youth Program brought in more support. While we rode around Canada on the Big Ride, she finalized details, found interested youth, ordered gear and made things happen. 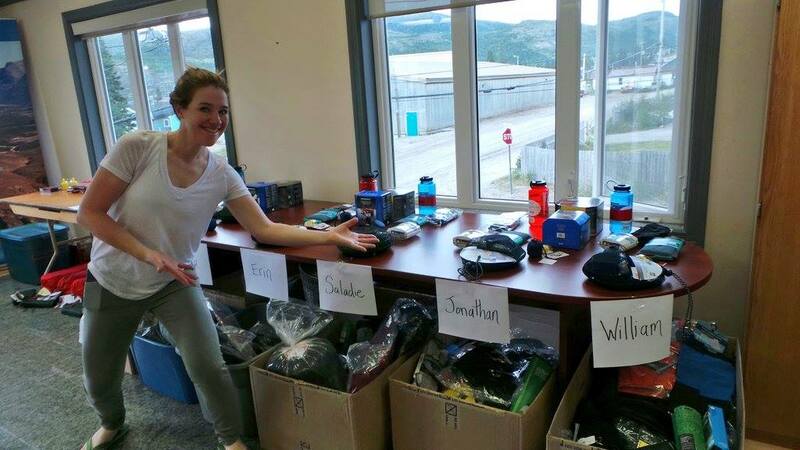 Now, Peter and I are in Nain, Nunatsiavut, Labrador, prepping with our youth to set out into the wilds of the Torngat Mountains. This is the land of their ancestors. This time around we will be with Andrew and possibly Ned again, as well as the amazing young woman called Duru. We’ve been hiking around Nain with her and can’t wait to move on the land with her abundant spirit. And of course, the youth. This year’s Team: Ocean Lane, Saladie Snowball, William Keelan and Jonathan Lidd. Me, Peter and Duru, as well as Andrew and our bear monitor will be there, too! How this will unfold is yet to be seen. Even if we only had our time in Nain, I would leave with an abundance of experiences never to be forgotten. Like seeing everyone eat a buffet of freeze dried foods for the first time, looking in wonder as to how something all shriveled up and dry can turn into ‘what it says it is on the package’; or see the surprise of a dragon fly cook stove light up and boil our water. Or how all the gear gets stuffed into small sacks and fits in the backpacks. There are still many things to do to be ready for our plane, boat and helicopter to our starting point for the hike. Which is why I keep thinking of that first day we had with Andrew and Ned. That first sound of silence and feeling of awe we experienced just under a year ago. We’re a few days away and I can’t wait to begin.